George Frideric Handel’s 270-year-old “Messiah” met GCU’s 3-month-old Arena on Thursday night, and each was better for the experience. The Christmas classic, which takes nearly two hours to perform but took Handel only 24 days to write, has been heard in churches and concert halls the world over, in a multitude of variations. Several years ago, one New York critic complained of its “numbing repetition” during the holiday season, and the majestic “Hallelujah!” chorus has been hijacked ad nauseam by the advertising world. Certainly, some “Messiah” fatigue is out there. 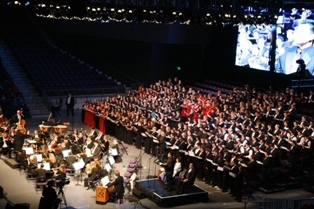 However, a 400-voice choir accompanied by the Phoenix Symphony breathed new life into the old warhorse, thanks in part to the Arena’s high-definition video screens and a pair of GCU vocalists who demonstrated why the College of Fine Arts and Production has made it all the way back. From the choir’s first notes of “And the Glory of the Lord” to the finale of “Worthy Is the Lamb,” this was a performance to be remembered, historic in the life of the University and worthy of the standing ovation it received. The Arena’s huge, 15- by 35-foot center video screen was used to maximum effect throughout the concert, showing close-ups of guest conductor Gary Wedow and the musicians and choir members. It was like having a PBS telecast — with the tight camera shots that reveal so much detail and expression — available at a live performance. The feeling of intimacy was remarkable, even in the seats farthest from the south-end risers where the choir was situated. 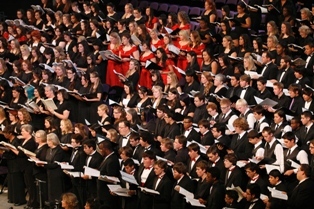 The smaller boards on either side of the big board were employed in lieu of a printed program, making it easy for the audience to follow the various segments of “Messiah” and to identify the four soloists: tenor Gabriel Salazar, bass Christopher Herrera, mezzo-soprano Rachel Velarde and soprano Sheila Corley. If the names of Salazar and Corley sound familiar, they should be. Salazar is GCU’s campus music minister, and in that role he directs the New Life Singers and the Chapel band. Corley is the Music Department’s vocal coach, a mentor of sterling reputation who in her previous tenure at GCU helped develop the prodigious talent of Salazar’s wife, Amber Wagner, an alumna who is on the verge of international opera stardom. You probably couldn’t find two busier people than Salazar and Corley on campus these days. The Christmas season is notoriously brutal for those in the performing arts, and at GCU the work this year has involved the opera “Amahl and the Night Visitors” (Corley), a whirlwind of New Life appearances (Salazar) and the Music Department’s annual Christmas concert (both of them). Incredibly, they found time to add a full complement of “Messiah” arias to the mix. Salazar’s “Every Valley Shall Be Exalted” and Corley’s “I Know That My Redeemer Liveth” — familiar pieces even to those only casually acquainted with Handel’s masterwork — were splendid, rich with emotion. With gifted instructors such as these, it’s no wonder the University is once again attracting the best and brightest students to its music program. Kudos are in order, also, to COFAP Dean Claude Pensis, who had the vision many months ago to bring “Messiah” to a then-unbuilt Arena. A production on this scale presents a logistical challenge, involving choirs from nine high schools and community colleges in metro Phoenix, in addition to GCU’s. After working independently, all convened for a rehearsal with the orchestra and the concert came off beautifully. Without Pensis’ foresight and his relationships in the Arizona arts community, a massive undertaking like this one probably doesn’t get done. We’re glad it did. Hallelujah, indeed! Special Kudos also to Dr. Juan Hernandez- the Dean of music! His hard work rehearsing the Choir and leadership with the GCU Choral Union. He worked so hard and the Choir members will never forget this experience. Its not every University that gets to sing along with the Phoenix Symphony! What a great experience. Thanks also to Brian Mueller as well without whom none of this would be possible :) What a great team of leaders our campus has! And God really moved in that music!